26 years, 10 months, 15 days old age. 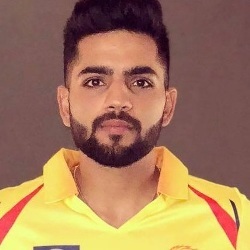 Dhruv Shorey will turn 27 on 05 June, 2019. Only 1 months, 15 days, 22 hours, 13 minutes has left for his next birthday. Dhruv Shorey has celebrated the total number of 26 birthdays till date. See the analysis by days count and bar graph. Dhruv Shorey was born on 05-06-1992 in Delhi, India. He is an Indian Cricket Player. Dhruv Shorey is a stylish middle order batsman from Delhi. He made his first class debut in the year 2015-16 and has never looked back since then. He was branded as a red ball cricketer after his success at the longer format of the game. He however proved his mettle in the domestic T-20s as well and that helped him garner a contract with the IPL franchise Chennai Super Kings at the IPL 2018 player auction. He was roped in at his base price of 20Lakhs INR. The 2017-18 season has arguably been the best season of his career thus far and will love to carry that form to the IPL as well. His father's name is Ranjan Shorey. He lost his father while he was still in his teens. To support his family, he worked at the RBI and continued playing cricket by joining the Sonnet Club. His dad was his first mentor who introduced him to the game of cricket. Besides batting, he is also a handy off-break bowler.